In the world of Eos, you ought to start them out young. I think we all want character builds that can disintegrate opponents in the early game. After all, that’s when we’re the most vulnerable. Therefore, maximizing your ability points (AP) is a very crucial strategy that an expert player should consider to devastate opponents as quickly as they can. Unlock exploration nodes in Ascension that are related to camping, character skills, and driving the car early to gain AP earlier. Unlock Magic nodes in AScension in order to develop a powerful black mage configuration that’s able to easily destroy enemies in the first half of the game. You’ll begin at Hammerhead, when you complete the initial main quest talk with Cindy. You’ll have gained 10 AP. Here, ignore the main quest. There, find and absorb energy from elemental deposits and camp there for 1 AP. You should choose a recipe that does not require ingredients. Complete the Stirred, Not Shaken tour with Ignis for 20 Ap. Go to the Minimart. Purchase 91 bottles of Sheep Milk. Your total now is 92, since you had one bottle with you from the start. Proceed with the main quest. You should complete the first four strategy tutorials, gaining 12 AP. Defeat at least three enemies with warp-strikes, blindsides, or parries for an extra 3 AP. By freeing Dave and hearing his request, select “do it for a price” to earn 2 AP. Go to Merrioth Haven and absorb all the elemental energy there. Unlock your first ascension node: HAPPY CAMPING. Camp again, so that your party shall reach level 3, earning you 26 AP en toto. I love the smell of firaga in the morning. In the morning, you may now unlock happier camping. Hunt the Dualhorn nearby by heading south in order to complete the tutorial strategy prompt on blindsides to gain 3 AP. You may use the three Fire spells in the Magic Flask you got from Dave in order to defeat the beast. After that, head south and east to Criclawe Haven. Gather all the elemental energy there. You should be fully stocked in the three elements by now. 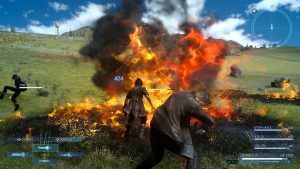 Train with Gladio at the haven and defeat him to gain 5 AP. After that, camp to gain 3 AP. there for another 3 AP. You can now learn Powercraft from the Magic Ascension tree. In the case you lack the AP, you can go back to Criclawe Haven and camp once more to gain AP. You can now craft your first powerful spell. Put all of your fire energy and Sheep Milk to a single flask. You’ll get 14 Dualcast Firaga spells with a potency stat of 207. Take note that roadrunning gives you 1 AP per 1.25 miles of driving. The appetize ability strengthens your allies with your favorite foods, as well as adding an extra AP every time you camp. Make sure you invest in Sheep milk to restock your spells when they get depleted. 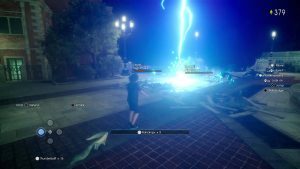 You can also unlock Noctis’s second accessory slot, fitting him with Magic-boosting equipment. Make sure to unlock elementality and extra powercraft to further develop your magical prowess.